Storm water is an important factor in the health of our estuaries and their suitability for oysters. We still have many Combined Sewer overflows emptying in the Charles and Mystic Rivers. When it rains, water quality drops in Fort Point Channel, East Boston, Winthrop, the Charles River, the Mystic River, etc. etc. So one of the ways to help get the blessing for restoring oyster reefs is to clean up what is flowing into the waters at those locations. This also is an issue for the Merrimack and other rivers around the Commonwealth. 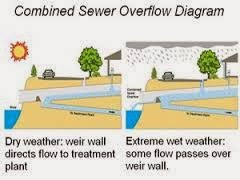 Combined Sewer Overflow Allows Waste to Flow Into Waters. Come join us Wednesday March 12 in Worcester to meet researchers, practitioners, and policymakers in order to identify challenges, opportunities, and next steps within the context of stormwater in our region. The Water Resources Research Center, WPI, and Clark University are hosting a day-long workshop “Current Stormwater Concerns and Solutions” on the WPI campus to get the stormwater community together and explore new solutions to this evolving problem. Please visit our website at http://wrrc.umass.edu/WPIworkshop to see the day’s agenda and to register. This event is free of charge and includes parking and lunch, but space is limited so please be sure to register by March 6, 2014.